Last year I wrote a post highlighting the type of Ajil, Persian Trail mix, enjoyed on Shabeh Yalda also known as Winter Solstice. Shabeh Yalda either falls on the 21st or 22nd of December and it is regarded as the longest night of the year. Winter Solstice celebrates the transition of fall into winter. 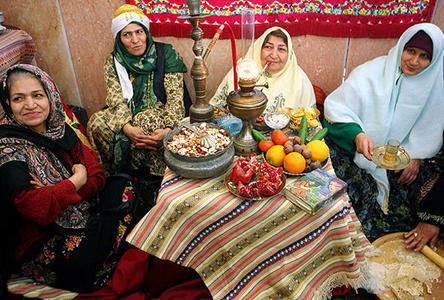 It is not surprising that Iranians celebrate this transitional time in nature as many of the cultural Persian celebrations coincide with the change of seasons. This year I would like to focus on Korsi, pronounced Kor-see. 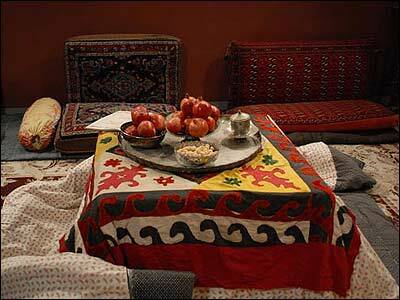 Anyone who has lived in Iran will have very fond memories of cold nights spent sitting around a Korsi to keep warm. A Korsi is incredibly easy to make, it is simply made from a short square table covered with a large comforter or thick blanket. In modern days an electric heater is placed underneath the table. Comfortable cushions are arranged on the floor around the Korsi for people to sit on. The idea is to sit on the cushion and cover the bottom portion of your body with the comforter that lays over the table. Last week I asked those who follow My Persian Kitchen’s Fan page over on Facebook if anyone had a personal picture of a Korsi to share. No one seemed to have their very own picture but one of the readers Bahar sent over a picture from an email forward that she had received. Said picture is the first image on this blog post. I actually loved the picture the second I saw it just because it’s such a beautifully put together Korsi. 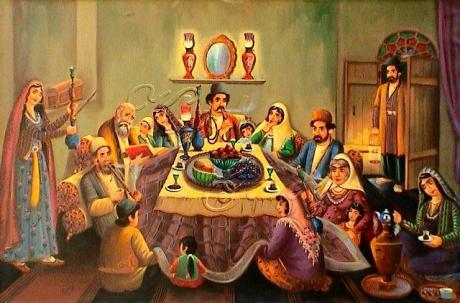 I also found the image above online and I think it best describes the spirit of Shabeh Yalda where families gather together and sit around the Korsi. The idea is to spend the night chatting away, reading poetry all while eating nuts, pomegranates, and the last of the watermelons available. I have very fond memories of being in Tehran during the cold months of winter and spending evenings under the Korsi. It’s so comforting and warm that you never want to leave. Sometimes, I even slept right there under to Korsi and never made it to my bed in my room! I miss having the same type of gatherings here in Los Angeles. I suppose I could move the furniture around in my living room and crate a Korsi area, but the space is not big enough and it would be a big hassle. But I know one thing, when and if a Korsi is built in our house, there is one member of our family who will enjoy it just as much as I would, and that would be our dog!!! I found this picture and a series of others that are worth while checking out on Mianeh. As I mentioned last year Shabeh Yalda has a very special significance for me. My mom was born during Shabeh Yalda a few moons ago when it fell on the December 22nd. Doostaneh aziz Shabeh Yalda mobarak! Wishing you all dear friends a very happy Winter Solstice! Iran Iranian Food Blog Persian food blog Winter Solstice! You could try purchasing a Japanese Kotatsu, which is basically the same thing, and might be easier for you to find and smaller. We used ours as our coffee table and converted it to a kotatsu in the winter. I love that you wrote about korsi. Although I never grew up with one, my mom has told me many great stories of her childhood around the korsi. I will have to ask her to tell me some more stories. @ Amanda, unfortunately, we have space issues, otherwise I would have been all over it!! @ Nay, do ask your mom to share stories! Happy Winter Solstice!! And, for good measure, Merry Christmas!! Tine!!! How are you??!! How was your trip to Iran?! Merry Xmas to you and a very happy new year as well!! I’m a relatively new reader to your site but I had to post to say THANK YOU for this information about the Solstice! My (half-Persian) son has been studying winter holidays in school and we were trying to get my (Persian) husband to tell us about winter holiday traditions in Iran. He is fixated on Noruz, which of course is not a winter holiday tradition AT ALL. 😉 I was showing him your website tonight and we were so excited to see a post about… actual winter traditions in Iran! So we shared with our son and he was very excited. I must also thank you for your wonderful recipes. I have recently started cooking more Persian food because my husband hates American food so much. I pressure cook everything, but he has enjoyed everything I’ve made from this site. Lisa, welcome! I am so happy that you make sure your son knows about Shabeh Yalda. It’s important to pass on our culture from one generation to the other!!! Keep cooking! oon poshti too akse shoma kheyli ghashange; midooni kojaa mitoonam poshti (mesle oonaa to aks) bekharam? In jaa tooye amrika sakhte peyda kardanesh. It’d be nice to find them already-made, but if you even just know a place where I can find the carpet fabric used to make poshti, I’d appreciate it. Ghazal, I have no idea as the picture is not mine. What an interesting post! I enjoyed learning a bit about the Korsi tradition! Your food looks great, I’m looking forward to trying some. Is there anywhere we can buy a Persian Korsi here in the US? Farshad, not sure about that. I have been looking into that myself lately!